Which Real Estate Portals Can You Trust? Editor’s Note: The following is the cover story in the November issue of RISMedia’s real estate magazine. As other real estate portals focus on scaling and capturing more consumer traffic, Homes.com is focused on meeting the needs of the industry. The company isn’t worrying about attracting tens of millions of eyeballs to its website. It has a vision that’s much more focused: to be a trusted friend of the industry while driving quality consumers to their advertisers. Gaining—and keeping—credibility with brokers and agents can be challenging when competitors introduce features that can cut real estate agents out of the process completely. It’s no wonder there’s a certain amount of skepticism and fear among agents who are forced to pay to get leads back on their own listings. But there’s no confusion about Homes.com’s motives. Since its inception in 1992, Homes.com has connected buyers and sellers with professional real estate agents. It also offers direct exposure for agents’ listings without a pay-to-play expectation. And that means directing all leads—whether a listing agent pays for marketing on Homes.com or not—back to that listing agent for each and every listing displayed on its site, says Homes.com President David Mele. When brokers decide whether to advertise on portals with more than 100 million monthly views, it becomes a matter of diminishing returns, he points out. 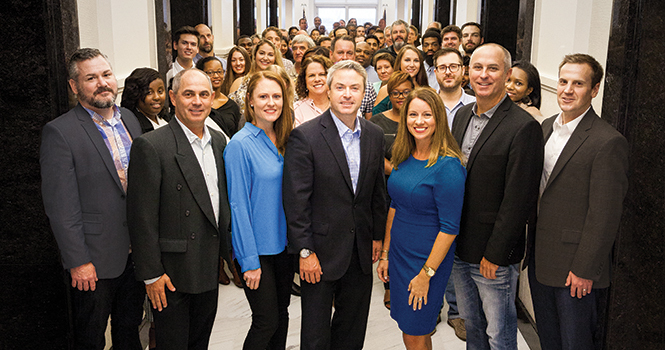 With more than 400 employees spread among its headquarters in Norfolk, Va., and three other offices in Florida and California, Homes.com is growing at a measured pace. Its focus on pursuing “transaction-ready consumers” instead of more passive shoppers makes Homes.com’s value impossible to discount, Mele says. With a clearly defined business model that avoids stepping into the murky waters of real estate brokerage sales, Homes.com wants agents to know leads on their listings will always go to them. Simple concept, right? But that’s a challenge to communicate when bigger portals blur those lines, says Andy Woolley, vice president of industry development at Homes.com. Do I always get free leads on all of my listings? Don’t assume. “Some of the largest real estate portals don’t always do this and will require that the listing be upgraded for the listing agent to receive leads,” Woolley says. Will your website clearly list my name and contact information on all of my listings? Another point of contention among brokers is that a listing agent’s name and contact information should be displayed on their own listings. After all, they’re investing time and marketing to sell the property. But this isn’t always done on other search portals; you have to read the fine print of your contracts, Woolley cautions. On Homes.com, however, each listing clearly identifies the listing agent’s name, phone number, photo (when available) and a “listing agent” title to make it clear to consumers who they should contact about that listing, he says. Do your listing pages display all of the property photos uploaded on the MLS? Many MLSs no longer restrict the number of property photos you can upload with your listing, but search portals sometimes do. If all the listing photos are not being displayed, your listing could be missing out on potential buyers. You’ll find little disagreement among brokers and agents that listing data from the MLS is the most accurate and timely information about properties. After all, who knows listings better than the agents who are selling and marketing them? That’s why, Woolley says, it’s important for brokerages and industry leaders to work hand-in-hand with MLSs. Doing so ensures that consumers get the latest and greatest data about listings on the market as easily and transparently as possible, Woolley says. The majority of Homes.com’s listings are sourced directly from MLSs or franchise groups, with permission from brokers. The scale of Homes.com’s data aggregation effort is massive, with more than 3 million active listings and 45 million images processed from over 700 local sources. That effort requires significant technical expertise, coordinated with a diligent industry development program. Homes.com is a big believer in the new Council of Multiple Listing Services’ nationwide campaign, “Making the Market Work,” which communicates the fundamental place the MLS holds as a guarantor of basic principles real estate professionals rely upon. Woolley is at the table as a partner and liaison to the industry, having recently been elected to the board of directors of the Council of Multiple Listing Services, or CMLS, which represents some of the largest and most influential MLS organizations across the country. As business partner director for the Council, Woolley says his goal is to advocate for MLSs. Of course, it’s this type of visible leadership on pressing industry issues that helps reinforce Homes.com’s position as a friend to the industry. You won’t see Homes.com in flashy TV commercials, because the company’s focus is on providing value to the real estate industry. Instead of spending on mass marketing, Homes.com is investing in product innovation. In fact, they are in the process of completely rebuilding their website from scratch to deliver a best-in-class home search experience. Most real estate sites greet users with a search bar that shows only a limited number of items buyers are looking for, such as the price range or the number of desired bedrooms and bathrooms. Homes.com won’t mimic that tried-and-true and predictable experience. Instead, it will use artificial intelligence, or AI, to generate more precise listing-to-buyer matches based on less rigid filters and more personalized results. Other features of the new Homes.com include online collaboration and sharing that allows users to send listings to relatives or friends to view photos and details, and gather feedback on the homes. All in all, Homes.com’s new consumer search experience will continue to keep agents at the forefront of the home-search process, and provide them more transaction-ready consumers for a quicker path to conversion. Real estate agents have to market listings if they want to get to the closing table with the right buyer. Homes.com provides exposure to a transaction-ready consumer audience to help agents do just that. In addition to advertising on Homes.com, the company offers marketing tools for modern-day agents—without abandoning the traditional emphasis on building personal client relationships. One such tool is SEO Fuel, a marketing system that offers a two-pronged approach to help real estate websites rank higher in a search engine’s organic results, says Erin Ruane, Homes.com’s senior vice president of marketing and sales. The higher the ranking, the more likely a consumer will learn about and visit a website. Homes.com’s SEO experts focus first on onsite optimization to make sure their customers’ content is relevant and crawlable by the search engines. Secondly, the SEO Fuel program publishes relevant content for homebuyers and sellers across the web, linking those interested consumers to their customers’ websites, further driving interested traffic. Another popular marketing tool is Social Fuel—a comprehensive social media solution for effectively managing social media presence and online reputation for agents and brokers. The program posts regional content and manages Facebook ad campaigns on behalf of the agents. It also monitors the agent’s online reputation, gauging it against that of his/her competition. Lead Concierge – The service screens inquiries on the agent’s behalf, and will live transfer interested buyers and sellers directly to agents so they never miss a chance to convert an inquiry into a prospect. Homes.com Fusion websites – These websites are built on a responsive design platform created specifically for real estate, Ruane says. The websites feature simple yet powerful search options, including map search, detailed neighborhood reports, large photo display, and easy save-and-share options. .Homes domain names – A new offering, .Homes is the perfect domain name extension for agents or brokers who want a more intuitive URL for their business website. Having a truly unique URL is becoming more difficult, as domain names with a traditional .com extension are harder to secure. The .Homes domain names are also exclusive for use within the real estate industry with only validated, real estate-related businesses allowed to purchase and use the .Homes domain extension. Local Connect – On Homes.com, this advertising product helps agents connect with active buyers and sellers in their target market, by zip code. When buyers and sellers are ready to connect with a local expert, Local Connect puts agents in the right place at the right time to receive those inquiries. Featured Agent/Broker – This program prominently brands the agent/broker and their listings on the search results page of Homes.com, while driving traffic to an agent/broker’s listings, website, and social media accounts through direct links and calls-to-action. Since 2005, Homes.com has powered remax.com, the RE/MAX® brand’s consumer-facing website, and has listing display agreements with all the Realogy brands, along with other major brokerages throughout the U.S. and Canada. The value proposition to these enterprise partners, as Woolley calls them, has always been constant: drive their agents as much business as possible—even if the lead comes directly to Homes.com. The goal is to always direct those leads downstream from Homes.com to a broker or an individual listing agent. The big portals—Zillow, Trulia and realtor.com®—operate as consumer companies with an outward-facing brand. But having too much control over consumers’ exposure to listings can hurt rather than help the industry, explains Woolley.